Brevik is the place in Norway I most wanted to see. My grandmother’s sea-captain great-grandfather, Ingebrigt Martinus Hansen, was born there in 1818 and emigrated to America by himself in 1836. As far as I can tell, his parents, five brothers and two sisters remained in Norway. Was he a rebellious teen? Or simply restless, adventurous? His grandfather was a ship’s carpenter, his father and four uncles, all sailors. According to Wikipedia, Brevik is thought to be one of the best preserved towns from the sailing ship era. Brevik is now part of Porsgrunn in the county of Telemark. The Brevik Bridge (Breviksbrua) in the background (above) goes over the mouth of Frierfjord to Stathelle, which is part of Bamble. It was opened in 1962. We arrived in the evening, much later than planned because our plane was delayed and it took forever to pick up the rental car. But the two-hour ride from Oslo was beautiful, the scenery lovely. Because the sun sets so late we were still able to stop for dinner and explore the town afterwards. The restaurant we found was Sjøloftet (above). Brevik isn’t a tourist destination per se, but we found that our server spoke English and was even able to find and dust off 4 menus translated into English. The place was naturally full of talkative locals and it was nice to just sit back and absorb the sound of the language and imagine, while looking out the window over the water, what life was like here 200 years ago. The roads going up and down the sides of the fjord in town were very steep! There were sailboats and motorboats tucked into every possible mooring. A switchback road can be seen to the left of and behind this building. Inadvertently we wound up going across the bridge! We were going through a tunnel and it came out right onto the bridge! I suppose it was inevitable as we were exploring the higher elevations of the town. But we made a u-turn and crossed back to Brevik. We actually got pretty confused exploring the town. Some of the streets were very steep and had surprise dead-ends! This little part of town is tucked under the older Brevik Bridge. When we found the correct tunnel to leave Brevik we had to wait and then follow a leader car through it because only one lane was open. We didn’t see any flagmen in Norway where there was roadwork being done. Everyone just waited patiently until the leader car was done leading the opposing line of traffic through and then turned around and signaled for them to follow. Satisfied to have seen the place where my ancestor started his journey, we headed for Skien to spend our first night in Norway. 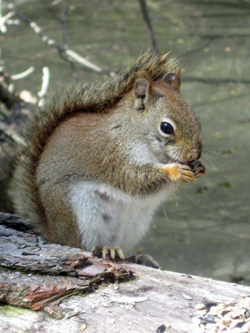 Groton is also home to Haley Farm State Park. Last year in February Beverly and I took a long walk here, too. 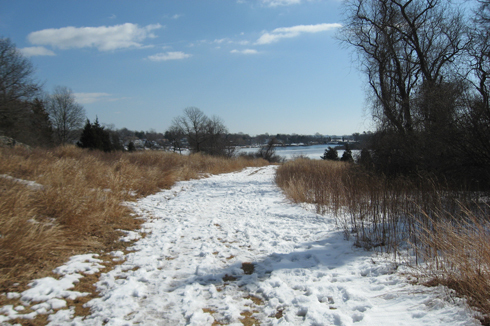 This winter I have not been as interested in getting outdoors, but it’s nice to remember when I had a bit more energy, and blog about last year. Above is a lovely view of Palmer Cove from Haley Farm. The backside of Canopy Rock, above. 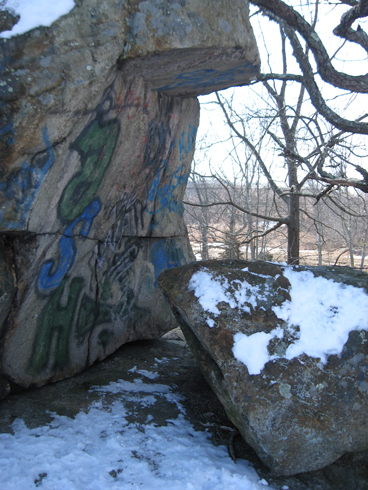 It seems to be a place for kids to hang out and leave artwork. We didn’t see any litter, which was thoughtful of them. 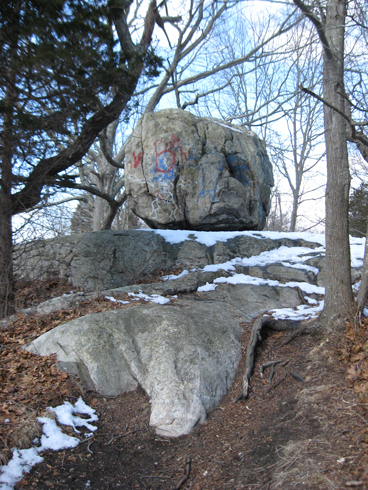 In the above side view picture the “canopy” part of the rock is clear. In the distance is the Amtrak railroad elevation. 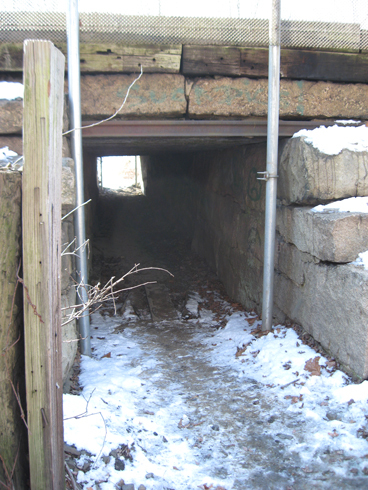 In the picture below is a tunnel under the railroad tracks, originally used for livestock – it must have been small livestock – clearance is only 4 feet! Can’t imagine a cow crawling under there! If one doesn’t mind crawling through, our map tells us that on the other end of this tunnel are paths connecting to the trails in Bluff Point State Park. We didn’t attempt it, curious or not, we’re not engineers but we wouldn’t want to be under there if a train should zoom by overhead. A little close for comfort, too. At least we could see the light at the end of the tunnel. 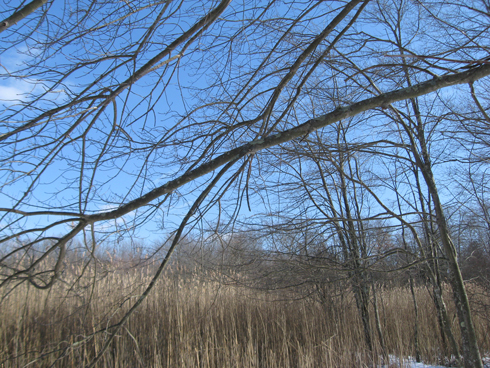 But, still… If we turned around now, we could see Race Track Pond, or actually the reeds surrounding it. We decided to follow a deer trail, figuring they would know the easiest way through the reeds to find the pond for a drink of water. 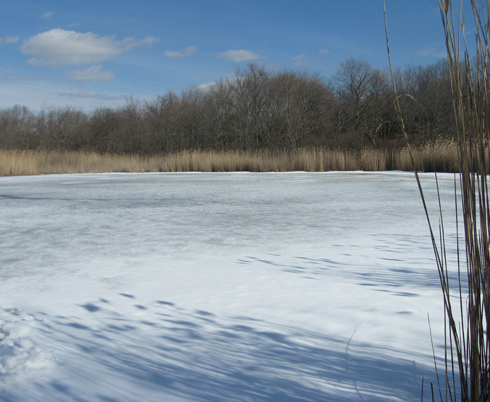 We did find a spot where the ice had been broken through and guessed that might be where the deer would find their water. 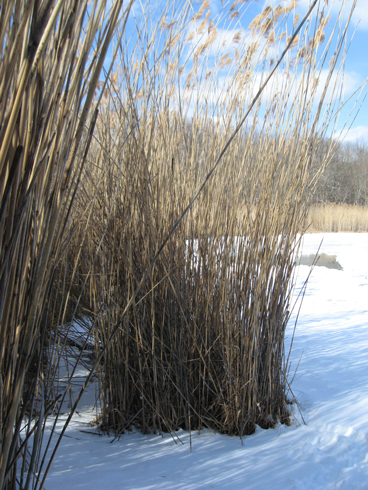 It was beautiful with the long winter shadows of the reeds on the snow-covered ice. We didn’t know it then, but we were to be inexplicably unable to retrace our steps. Lost! When a man named Caleb Haley owned the farm he built a lot of stone walls around his pastures, using an ox drawn stone-puller. I meant to photograph some of them on our way out, but, we were very cold and had very likely been walking around in circles trying to figure out a badly drawn map. When we finally saw the entrance (exit!) I quickened my step and fell on an icy spot of snow. Wrenched my shoulder so badly it still hurts a little even now, a year later. So perhaps this year, maybe in the spring, I’ll return and try to get some stone wall pictures!